It looks like the rumours were true. Microsoft’s latest laptop-tablet hybrid device is the budget-focused Surface Go. The 0.52kg (1.15lb) laptop, which in a way is a successor to the tech giant’s last low-cost Surface 3, is available for pre-order in Canada on July 10th starting at $502.55 CAD (the regular starting price is $529). The Surface Go features significantly lesser specs than the standard Surface Pro, including a smaller 10-inch 1800 x 1200 pixel display, a less powerful Intel Gold 4415Y processor (which features two-cores) 4GB of RAM, 64GB of storage and an estimated battery life of nine hours. A 128GB Go with 8GB of RAM is also available for $664.05 (regularly $699). 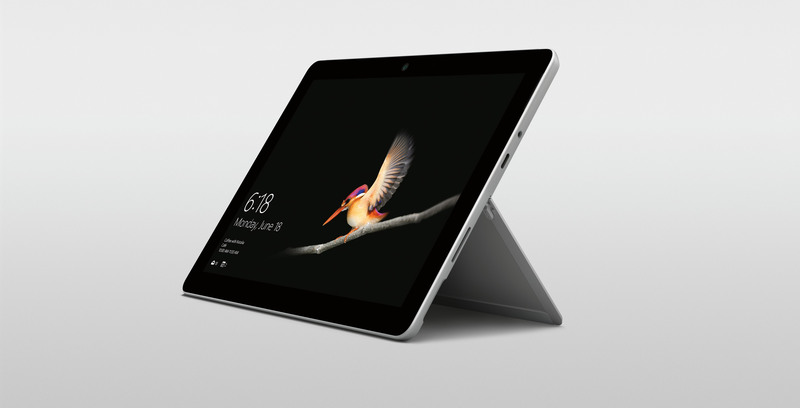 That said, the trademark design of Microsoft’s Surface line is still featured in the Go, including an adjustable kickstand, an 8-megapixel rear and 5-megapixel front-facing camera, Windows Hello and finally, even the controversial Surface Connect magnetic charging and dock port. Further, Surface Go’s display is capable of 10-finger multi-touch, features Surface Pen compatibility, includes a 3.5mm headphone jack, a microSDXC card reader slot and, surprisingly, even a USB 3.1 Type-C port. It’s also interesting Microsoft opted for the USB-C route with the Go given the shade the company has thrown at Apple’s MacBook line in the past. It seems the recent reveal of Microsoft’s $99 bulky USB-C dongle foreshadowed the Surface Go’s release. The bezels surrounding the display are also quite substantial. 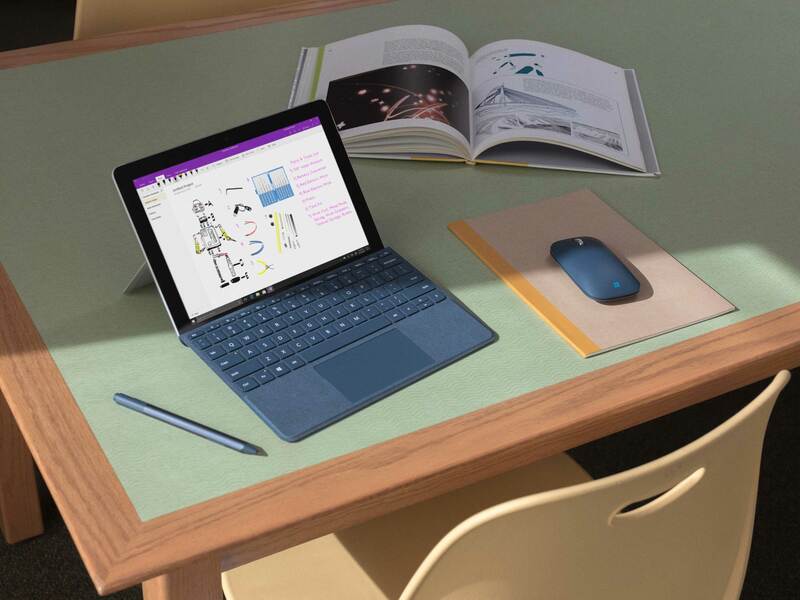 As expected, the Surface Go is also compatible with Microsoft’s Type Cover keyboard, though due to its 10-inch size, the laptop-tablet hybrid device requires its own specifically designed keyboard. Microsoft says that it plans to soon introduce versions of the Surface Go that feature LTE support and 256GB of SSD storage, though it’s unclear when this iteration of the device will be released. Adopting the 10-inch form factor will make the Surface Go more usable as a tablet when compared to the 12.3-inch Surface Pro and 13.5-inch Surface Book. That said, it will also contribute to making the hybrid device more frustrating when in standard laptop mode. I found both the original Surface as well as the Surface 2 too small for every-day use. It wasn’t until the 12-inch Surface Pro 3’s release that Microsoft’s hardware line started to click for me. Still, it’s interesting to see Microsoft take a different approach with its latest budget hardware effort, rather than just equipping the Surface Pro with lesser hardware. In many ways this is Microsoft’s answer to Apple’s 9.7-inch (2018) iPad with Apple Pencil support. Pre-orders for the Surface Go will be available on July 10th with shipping expected on August 2nd. The optional Type Cover and Surface Mouse are priced at $128.99 and $44.99, respectively. Are you interested in the Microsoft Surface Go?